That group includes the city’s eight exam-based specialized high schools, including Stuyvesant, the Bronx High School of Science and Brooklyn Tech, where admission is based on a single, three-hour multiple-choice test known as the SHSAT. “Students that have made their way into the specialized high schools have largely done so as a result of advantages their families have been able to give to them already,” said Lazar Treschan, director of youth policy at the Community Service Society of New York, a nonprofit advocacy group that joined a legal complaint filed by the NAACP in 2012 challenging the SHSAT as discriminatory (the complaint is still pending with the federal Department of Education). But many educators and parents defend the additional money for the schools, saying that even they are vastly underfunded and have trouble meeting higher academic demands. The education department defends allocating the funds to the 13 schools, saying that they incur more costs by exceeding the academic requirements of traditional high schools. But department spokesman Will Mantell could not explain specific criteria for which schools receive the bonus. The Department’s guide to Fair Student Funding stipulates only that the money go to “academically challenging high schools.” But Mantell could not specify why, for example, Millennium Brooklyn receives the bonus, but its sister school, Millennium Manhattan, which has a similar curriculum and admissions criteria, does not, or why the iSchool was added to the list. The city reviews the formula annually. The specialized high schools are known for their academic excellence, offering a range of Advanced Placement classes and routinely sending graduates to elite colleges. But the schools admit few black and Hispanic students. Last year, black students received only 3.8 percent of offers to specialized high schools, while Hispanic students received just 6.5 percent of the offers, education department data show. At Stuyvesant, just 13 black students were offered admission for the 926-student freshman class this year. During his campaign, Mayor Bill de Blasio called for ending the specialized high school admission exam. But in office he has not pushed the issue. Before the formula was instituted, the education department’s central office gave most schools a fixed number of teachers per student, rather than dollars. But schools with more veteran teachers, who earn more, ended up getting more money to cover those larger salaries. The net effect, according to Klein, was that schools with similar populations of students ended up with vastly different amounts of city money. The new formula gave all schools a fixed number of dollars per student, allowing principals the freedom to spend the money as they chose. Currently, city schools are supposed to get about $4,000 of city money for every student on their register. Schools get additional dollars based on the number of students who need extra academic support. Students who are learning English, for example, bring an extra 12 to 55 cents on the dollar. Special education students and students who are struggling academically bring extra money as well. 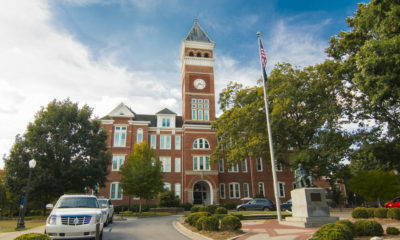 Separately, schools get state and federal funds, and money for special city initiatives, such as the drive to offer advanced placement classes in all high schools. Since 2012, 13 of New York City’s most coveted high schools have received more than $100 million in additional funding. The specialized schools are part of a larger group of schools that get extra money from the formula because they offer alternative models of education that cost more to operate, according to the city’s Fair Student Funding Guide. These include performing arts high schools that require auditions for admission, such as Fiorello H. LaGuardia in Manhattan and Frank Sinatra in Queens; career and technical schools that train students in vocations; and transfer schools for students who have dropped out of traditional public schools. Even with the bonus, the specialized high schools often get far less per pupil than most schools. That’s because they serve few students learning English, special education students or low achievers. And like almost all city schools, they don’t receive 100 percent of the funding the formula calls for. That is a legacy of years of state budget shortfalls that routinely leave the city with less from the state than promised. For example, Brooklyn Tech, from which de Blasio’s son, Dante, graduated in 2015, gets about 88 percent of the amount it is supposed to based on the Fair Student Funding formula (or $5,328 per pupil this year). Last year, Stein, the former Brooklyn Tech PTA co-president, began a campaign to fund the school at 100 percent of its formula amount, after she noticed a series of problems related to underfunding. One example: her daughter took an online SAT course at the school and reported that half of the computers didn’t work. “Kids called in ‘Broken Tech,’ ” she said. Brooklyn Tech Principal David Newman declined to comment. Each fall, some 80,000 New York City eighth-graders select from a dizzying array of more than 400 high schools, and rank their top choices; they can apply to up to 12. Choices can include schools required to accept anyone in their geographic zone and those that screen applicants based on grades, attendance and standardized test scores. 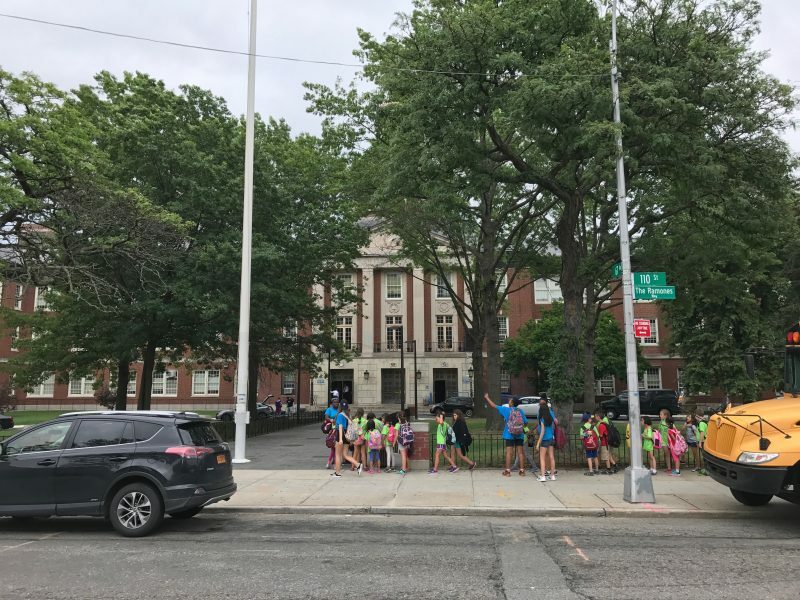 Separately, students may also try out for performing arts high schools, or take the SHSAT for schools like Stuyvesant, which boasts several gyms, a swimming pool and four storiea overlooking the New York harbor. Stuyvesant had only 926 seats in this year’s freshman class, yet more than 27,000 students typically apply. Harvest Collegiate, a small high school near Union Square that doesn’t screen applicants, gets $7,644 per student from the formula. 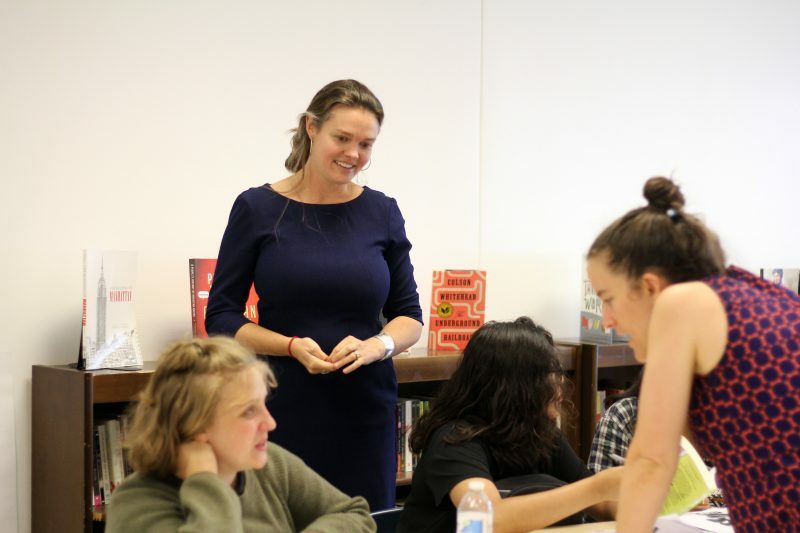 Kate Burch, the principal and founder of Harvest Collegiate, points out that almost a third of the school’s students are in special education, and another third have serious academic needs. The money, she said, pays for bilingual teachers for English-language learners, case managers for special education students and extra tutoring for struggling students. They are places like Forest Hills High, in Queens, which does not get federal Title I funding, provided to schools with concentrated amounts of poverty (defined by the percentage of students eligible for free lunch). The Title I cutoff is around 60 percent; at Forest Hills, 53 percent are eligible, according to the principal, Ben Sherman. Forest Hills High has 3,800 students, who attend school in three overlapping shifts. More than a third of the students are Hispanic, about a quarter are Asian and another quarter white; about 10 percent are black. More than 500 require special education services, and almost 1,000 test below grade level. The school has a magnet program in the sciences that attracts students from across the city, but it also guarantees admission to those who live in the neighborhood. “We are in deep financial pain right now,” said Sherman. The school gets $5,446 per student through the formula – this year. Townsend Harris High School at Queens College in Flushing, gets the specialized academic bonus – and gets almost $600 more per student from the formula than Forest Hills does, even though it had only four students below grade level and two students learning English this school year, according to the department’s data. Critics say the specialized academic schools have a financial advantage even without the city bonus: well-resourced and well-connected parents, who are tapped for supplementary money and oversee elaborate auctions that can raise tens of thousands of dollars. 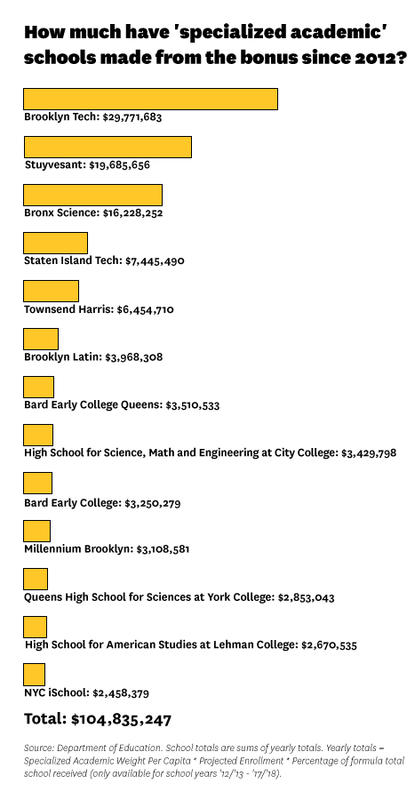 In addition, Brooklyn Tech, Bronx Science and Stuyvesant maintain endowments of $13 million, $6 million and $2.4 million, respectively, to help fund extracurricular activities. John B. King Jr., former secretary of education for Barack Obama, and now the leader of a nonpartisan research group called Education Trust, noted that resource disparities between the poorest and the wealthiest students are common across the country, often based on the different amounts of local funding that school districts can raise. But policies like the specialized academic school bonus can lead to inequity even within the same school district, he said. But he proposes distributing that money differently. “The funding should follow the student, not the school,” Nadelstern said.